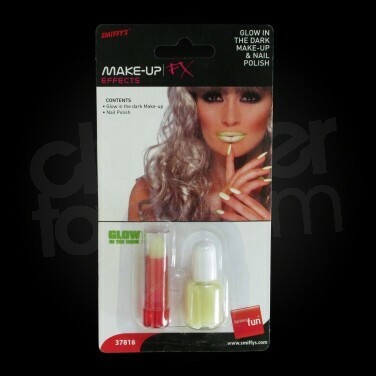 Create outstanding special effects with Glow in the Dark Make Up and Glow Nail Polish. Perfect for adding a little glow to fancy dress costumes and party or club outfits. Get funky luminous effects and highlight features for dramatic looks that also glow brightly under UV blacklight! Brilliant fun, apply glow make up over a white base coat to achieve best effects. Note: Contains luminescent pigment, not recommended for daily use. Fantastic for parties and fancy dress, especially at Halloween! Aqua (Water), PVP, Polyvinyl Alcohol, Zinc Sulfide, Polysorbate 20, Propylene Glycol, Triethanolamine, Phenoxyethanol, Carbomer, Parfum (Fragrance), Methylparaben, Lauramidopropyl Betaine, Ethylparaben, Propylparaben, Isobutylparaben. Paraffinium Liquidum (mineral oil), Ozokerite, Polybutene, Zinc Sulfide, Petrolatum,Candelilla Cera (Euphoribia Cerifere (Candeililla) Wax), Sorbitan Laurate, Ethylene/Propylene/Styrene Copolymer, Butylene/Ethylene/Styrene Copolymer, Parfum (Fragrance), Ethylparaben, Methylparaben, Tocopherol, BHT.